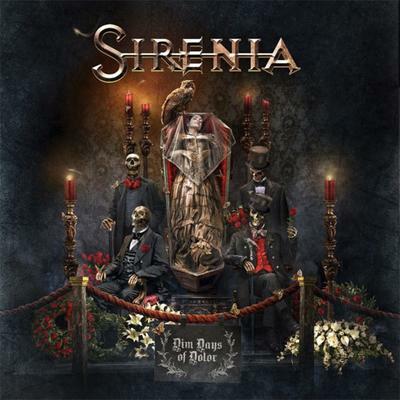 Sirenia’s newest release, Dim Days Of Dolor, is a majestic journey of heavy twists and melodic turns. This record marks the debut of Emmanuelle Zoldan as lead female vocalist. Zoldan has sung back-up with Sirenia for 13 years, making her familiar with the band and its sound. Her mezzo-soprano vocals are a major highlight on this record as they soar but never overshadow the songs. The opening track “Goddess of the Sea” sways back and forth like a ship at sea with its lumbering riffs. Zoldan’s operatic vocals are powerful and match the crushing music accompanying her. The title track is a fusion of symphonic metal and electronica bordering on pop metal. It is a bit surprising that this track is not the album’s initial single due to its accessibility and commercial appeal. “The 12th Hour” is the initial single for Dim Days, which is interesting as it is the longest track on the record and one of the heaviest. There is a strong death metal vibe on this song due to band founder Morten Veland’s shrieking vocals. “Cloud Nine” is another hard hitter with its staccato riffs and hammering drums. The choir sample fits well on this track adding to its heaviness. Album closer “Aeon’s Embrace” is a sorrowful piano ballad with Zoldan’s melancholic vocals underscoring the sadness on this song. Dim Days of Dolor is a varied album that showcases Morten Veland’s musical abilities. He successfully blends heavy metal, electronica and symphonic music to stunning effect. However, Zoldan’s vocals accentuate the emotions on each track, giving the music greater impact. The production is bombastic which is suitable for an album like Dim Days. The riffs, samples and of course the vocals are pushed to the forefront but the sound is clear and never choppy or noisy. Fans of Sirenia and symphonic metal should purchase Dim Days of Dolor. It is an epic record with solid songs and incredible musicianship. The album’s 56 minute length is not tedious as there is little to no filler on this album. Zoldan’s vocals are superb throughout the record, and fit well on each track. There is nothing dim or sorrowful about this record and it is more than worth a listen.